This textbook provides a structured, easy to understand and thorough insight into the mode of function of plant secondary metabolites in plants and humans. 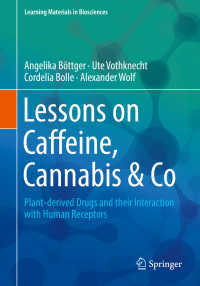 It explains the biosynthesis and molecular action of nicotine, cannabis, caffeine and Co, describes the effects of these drugs on signal transduction at receptors and ion channels in animals, their relevance for human health and their potential for recreational use and abuse. It also offers a broad and comprehensive understanding on the role and function of these diverse molecules for the plants that make them. This textbook is written for master students and scientist in biochemistry and biology as well as for pharmaceutical and medical students. It will be a valuable study tool for teachers and students alike. Introduction: Plant secondary metabolites and their general function in plants.- Historical and current perspective.- &nbsp;Medicinal use.- Recreational use.- General overview over biosynthesis pathways of plant secondary metabolites.- Drugs affecting GPCR: GPCRs in plants and animals.- Dopamine and 5-HT2A-serotonin receptors – Cocaine, mescaline, psilobin.- Opiate receptors – morphine, salvinorin A.- Cannabinoid receptors – THC.- Muscarinergic acetylcholin receptor - muscarin, atropine.- Adenosine receptor – caffeine.- Drugs affecting ion channels: Ligand and voltage activated channels.- Nicotinic acetylcholin receptor – Nicotine, Curare.- GABAA/C-receptor – Muscimol, thujone.- ionotropic Glycine receptor – Strychnine.- ionotropic Glutamate receptor - &nbsp;ibogtenic acid, kainic acid.- TRP channels – capsaicin, menthol, aconitine, resiniferatoxin.- Anti-cancer drugs acting on the cell cycle: Cell cycle in animals and plants.- Microtubuli - Colchicine, taxol, vinblastine, Podophyllotoxin (Lignan).- Topoisomerase - camptothecin, etoposide.- G2/M phase arrest, apoptosis – curcubitacin, triptolide.